This article describes the procedure that is applicable to Version 5.1 and newer. 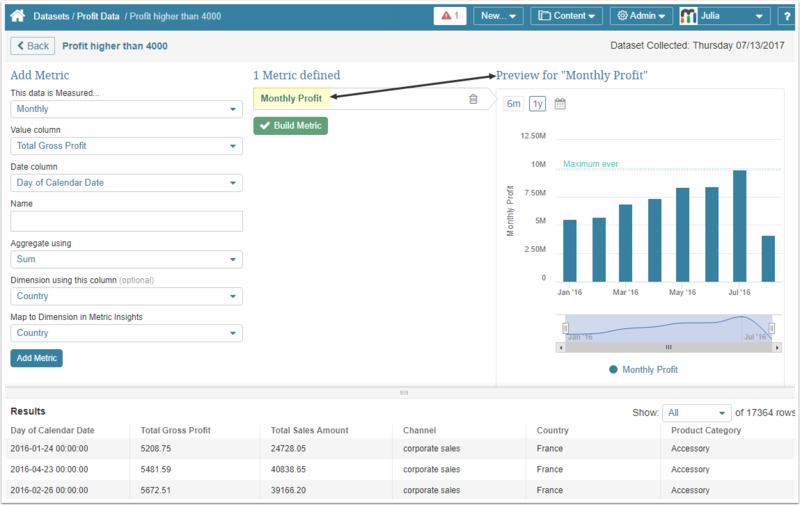 For prior Versions refer to Create a Metric from a Dataset View (prior to 5.1 release). User Interfaces may vary slightly from release to release. Datasets offer a quick and highly automated way of building new Metrics. This article describes step-by-step process of creating Metrics IN BULK from a specific Dataset. Admins and Power Users have an ability to create one or multiple metrics from a Dataset View. This easy-to-use proces helps to minimize the number of data entry fields that are usually required to be completed in order to create a Metric. Since Metrics always represent time series data, the source Dataset View must contain a date column and a column with values. Select the Build Metric option. If at least one element (Report or Metric) has already been built from this View, it cannot be changed to private. Define the basic settings for the Metric being created. This is accomplished by choosing the correct column name from the respective drop-down list. The list for each field is populated based on its Column Type; for example, the Date column drop-down list will only contain options representing date values. Since the Results set is always visible below, you see exactly what you are including in the Metric. Name: is populated automatically based on the selection made in the fields above, but you can change it to a unique and descriptive name of your choice. Optional. For creating dimensioned Metrics only. Dimension using column: Dataset's text columns may serve to dimension the Metric, meaning create a separate Chart per each Dimension Value. With a column used in this example (Country), separate Charts are created for each Dimension Value; e.g., France, Australia, Germany. This allows different sets of Alert Rules to be applied to each Chart and specific security Permissions to be granted to individual Users subscribed to the Alert. 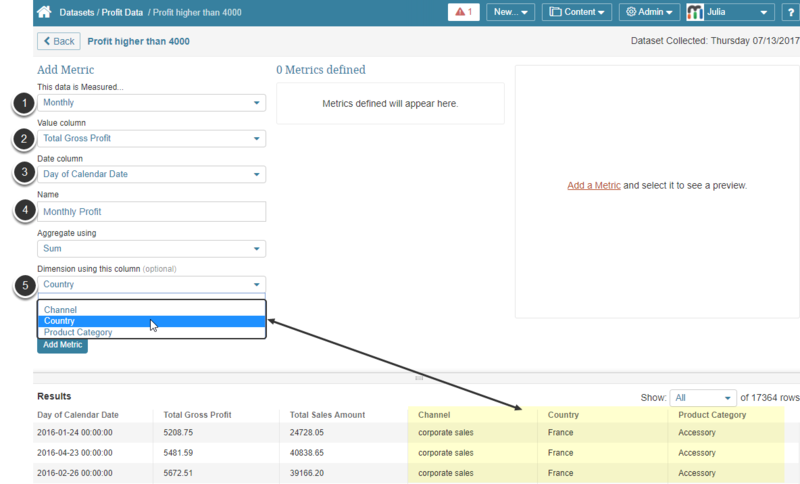 Map to Dimension in Metric Insights: if you already have a Dimension with values matching to those in the selected Dataset column, you can choose it from the drop-down list; otherwise, you can create one on the fly by clicking: "None - create new Dimension". Click Add Metric to save these settings and preview the resulting Metric. Settings such as Data Source (the method used to fetch the data) and Data Collection Trigger (how often this Metric is updated), and Category, are automatically inherited from the source Dataset. If only one Metric is being built, click Build Metric and let the system finish the procedure. These Metrics are just prepared, they are not built yet. When ready to publish all Metrics, click Build All Metrics. The Metrics that have been built are available on the Homepage. Prev: Filter combinations for comparing "Last two Instances"